So how's the new boat coming along Captain Z? I got a new Optima Gel to replace the old cranking battery after having to get towed in last Wednesday. I'm really learning to hate the jet skis on that one lake we don't talk about here. That is a weekday only lake. Lake Jessup is very pretty but also very bad for bass fishing. I thought the locals were BSing me about it being only good for Specks. Boy, I was wroooooooong. Add me to the list of guys who will never go there again. I'm definitely getting used to running around bigger lakes and how to position to accommodate wind so I am not standing on my trolling motor constantly. Darn good thing I gave you those ropes huh? Nice to have a bit of rope on the boat. I started carrying a tow rope because of all the people I have had to tow in off the St. Johns river over the years... more than I can count! But you know Z... in all my years on the water I have never had to be towed in. And you made it in 3 weeks! That's a record! Maybe you had better add jumper cables to the boat too! I could have saved you the time and trouble on Jessup... but experience is the best teacher! I wasn't really surprised by the battery dying. It was 6 years old and had sat for a long period of time before I got it. Annoyed? Yes. Surprised? No. 6 years is a long time for a battery and having set for a long time didn't help it much. Well now you have a new Optima Gel you should be good to go. So you saying you went Bass fishing and didn't catch any Was size are them specks in there. All I saw were gar. Not even big gar. But that reminds me that I need to get some white nylon rope and whip up some lures for those things. Yep Lip! Lake Jessup skunked him so whip out the printer on him! Locals have known for years and years to stay out of Jessup if you want bass. It is a beautiful lake, but the SJR does not flow through it so it never really gets flushed out. Any and all vegetation stays in the lake and rots reducing the oxygen levels and water quality is not as good there so the bass are sparse. I think Z said he talked to some locals one who said he never caught a bass there and another said in all his life he had only caught a few in Jessup. So it is known for NOT being a good bass lake. Thanks for validating my skunking, FFF. I’ve actually gotten used to it since summer is in full swing. On a good note I’m having fun. And will be able put new paper on the bathroom wall once Lip fires up the press!!! 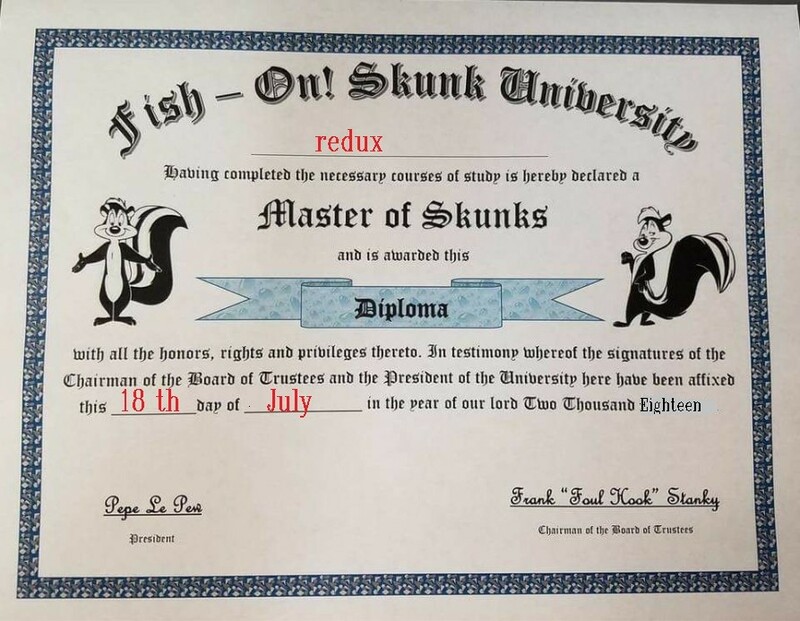 Best catch some specks, or a shad or 2 if you wish to avoid the certificates!!! Keep that printer out Lip! Something tells me you're gonna need to keep it warmed up and ready to go! Yep! Keep it warmed up for both of us! Well do. I'm glad I just got in a new order of ink and paper. Haha Thanks for piling on! Send me a bill for the paper, ink, envelopes, and postage you're going to start burning through if you're keeping track of my skunk days. Oh, not to worry, he has a paper and ink allowance added to his paycheck. I've gotten on some new water the last few weekends and have been putting time in on my local Lake X Other then the jet skis making donuts at the ramp I'm really enjoying the process of figuring out one body of water. Docks, grass, flats, canals, holes, more docks, pads, etc. are a lot of fun even if I am no longer on the bank.